Amy graduated with a BSC in Physiology at Liverpool before continuing her university education at UCLAN to complete her dentistry qualification in 2011. Whilst at UCLAN Amy was involved in research into composite bonding strengths and presented the results to the International Association for Dental Research in Barcelona alongside Professor Mair, Head of Dental School, UCLAN. She also regularly represented the university at BDSA and EDSA meetings. Since graduating in 2011, Amy has developed her general experience working in NHS, mixed, emergency and private practices in the North West. 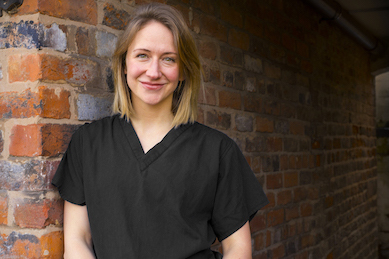 She loves working with the team at Dental Solutions in Lymm, having already spent time here covering Lauren Westhead’s maternity leave. Amy is qualified and experienced to perform a broad range of surgical treatments from fillings and root canal (endodontics), through to the surgical removal of teeth and short-term orthodontics. Amy is also a trained Invisalign and Quick Straight Teeth provider. She gets a great deal of satisfaction successfully treating very nervous and phobic patients and she is also trained to offer dental acupuncture as an option. Most patients subsequently become very comfortable about receiving dental treatment. Favourite Country: Wales. Amy is a trail runner and spends a lot of time there. She recently married a Welsh man in the Welsh mountains last year so it’s a place close to her heart. Hobbies: Trail running and fell running. Amy prefers to run ultra-distance which is anything further than a marathon. On a recent holiday in Switzerland, she ran the Eiger Ultra Trail which is a 101km race with 6700m ascent. Amy has also completed the 100-mile race in the Cotswolds in 2017. Before ultrarunning, she played a lot of hockey, captaining her city, county, university, in addition to the North of England.